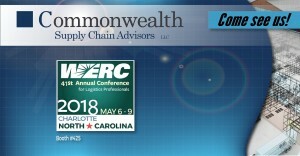 Commonwealth Supply Chain Advisors will have a significant presence at the Warehousing Education and Research Council’s (WERC) 41st annual conference. The event will be held May 6-9, 2018 at the Charlotte Convention Center in Charlotte, North Carolina. In addition to its participation as a solutions provider, Commonwealth has been asked to lead two educational sessions at the conference. Kevin Thuet, Senior Consultant, will be presenting, Beating Murphy’s Law While Introducing New Technology. The session will examine why companies struggle, or fail, when implementing material handling and WMS projects. Mr. Thuet will share the top causes of implementation challenges and teach attendees how to avoid these pitfalls. 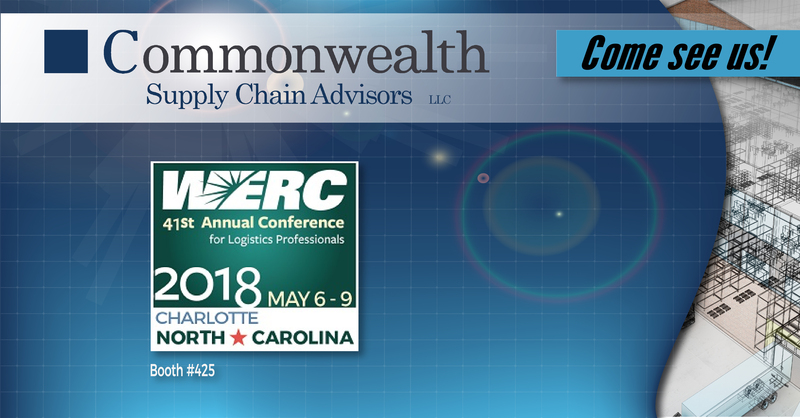 This session will be presented at 8:00 AM on Monday, May 7th, 2018 in room 208 A.
Commonwealth’s second educational session, Select the Right Software – Technologies to Drive Faster Fulfillment, will take place at 3:15 PM on Tuesday, May 8th in room 207 D. This session will be co-presented by Ian Hobkirk, Commonwealth’s President, and Commonwealth client, David Boyd, Senior Manager of Warehouse Capabilities of Ainsworth Pet Nutrition. Together they will teach attendees how to conduct a proper warehouse management software selection process. The audience will hear first-hand from Mr. Boyd, who recently undertook this evaluation at Ainsworth. Commonwealth will exhibit at booth # 425 in the Solutions Center, where it will share insights on the latest innovations and newest advances in processes and technologies in supply chain and distribution. Commonwealth’s perspective is gained from completing nearly 200 projects for more than 100 clients across the globe. Commonwealth Supply Chain Advisors is a leading supply chain consulting firm that helps companies of all sizes optimize their supply chain networks, design distribution centers, and select and implement Warehouse Management Software (WMS). Commonwealth has offices in Boston and Cincinnati. Every year since 2013, Commonwealth has been named a “Top 100” supply chain partner by Supply Chain Brain publication. Commonwealth’s insights are widely respected and regularly published in journals such as Supply Chain Management Review, Supply Chain Quarterly, and The Wall Street Journal. For more information, visit www.commonwealth-sca.com.